This one is Ian's. And it's not black! This is a shirt of firsts. 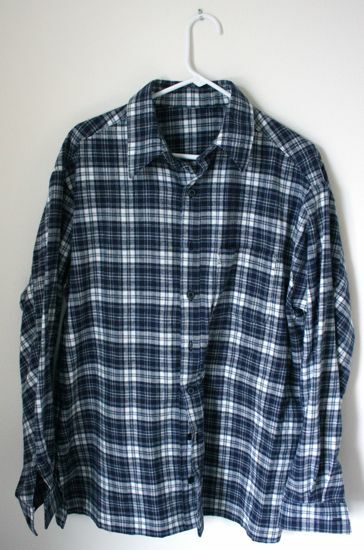 It's my first plaid. I'm absurdly pleased with myself for how closely I got the stripes to line up. The hardest part was more the fault of the fabric than the plaid. 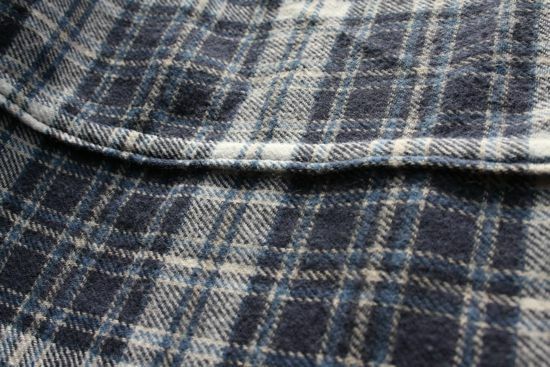 This is a rather loosely woven flannel, with a tendency to wobble. So the stripes may line up, but they aren't totally straight. It's the first time I did anything more to finish off an edge beyond zig-zagging it. I flat-felled just about everything, making it the first time I paid as much attention to the inside of something as the outside. I was a little afraid I would feel this process was taking too long, but instead I'm finding I'm really pleased with myself. Sure it took longer, but it was time taken to do something right. As a bonus, these seams should be super durable. Maybe not so much a consideration for Ian but a good thing when making clothes for Caitlyn. It's the first time I properly used the overlock feature on my machine, after stumbling over a post out there on the interwebs which explained how the overlock stitch was supposed to work. I've just used the zig-zag stitch in the past for finishing raw edges. Maybe now I'll go find out how the blind hem stitch is supposed to work. I used almost all my presser feet: walking foot for long seams, which helped with the wobbling fabric; regular foot for other seams; overlock foot for finishing off the armscye; blind hem foot since I could treat it like an edgestiching foot; and the buttonhole foot. I didn't use the zip foot (no zipper!) or my new quilting foot. It's the first time I've been that conscientious about using the right foot for the job. And I now have labels! 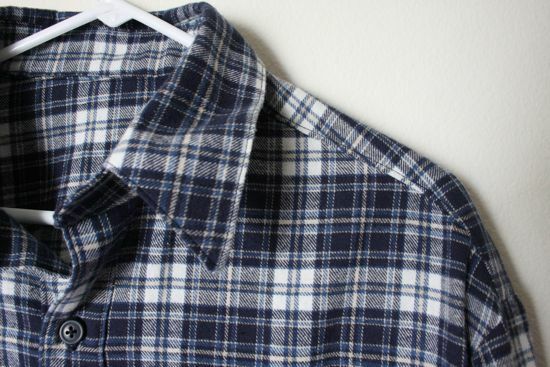 Not that Ian needs a reminder of where this shirt came from, but I'm really liking the polished feel the label gives. It's going to be fun working these labels into Caitlyn's clothes, future quilts and other projects. Thanks, Cassie! Next up: quilt blocks and then clothes for Caitlyn. I've had to retire one dress and there are others not far behind. I don't think we're going to be able to hold out for Elsie Marley to hold a Spring version of Kid's Clothing Week! I'm sure you saw she announced the spring KCWC for a month from now? A long time to wait (like I couldn't just see something anyways). Hazel has grown a huge amount since last winter so I'm looking at a fairly massive wardrobe changeover. 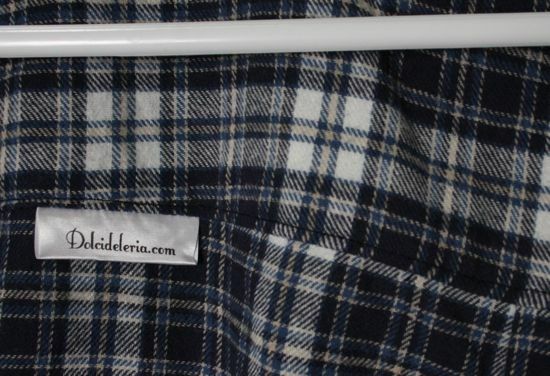 Well done with the plaid - it has the reputation of being one of the trickier things to sew! Actually, no, I hadn't seen that... but I'm behind (again) in keeping up with my feeds. Thanks! I don't think Caitlyn's closet will wait another month, though. I'm actually thinking about doing a "Caitlyn Clothing Month", since I figure it'll take me at least that long to make all the stuff I've got in the queue for her!